I had been messing about with rough pin curls for a while before The Beard cut my hair. They held ok, but didn't really last all day, leaving me with wavy naffness. I am pleased that this seems not to be the case with my new, shorter, head hair. I sectioned it off, spritzed each section of dry hair with setting lotion, did a loose flat loop and pinned. I have yet to really look at, let alone learn any proper setting patterns. I get all confused over which way to lay them. But, I do try to lay my haphazard ones all the same way when I get near my scalp. I was mighty pleased with the result. I gave it a very quick brush, fearing I might lose the curl. Delightfully, it lasted all day. These shots were taken after a day out in a windy town centre. Wondering in and out of, what turned out to be fruitless, charity shops. There are some straighter bits, but in all, I am tres pleased with the results. Although I read this book waaaaaay back when I was 17 (so long in the past I cannot even work it out), I am surprised how much of it I had forgotten and pleased that I decided to re-read. With the centenary looming, I thought I would revisit one of the best accounts of what happened that night. It does floor me slightly that no one really thought to collate witness accounts before the 1950's - but a whole lot of history happened in between and the world had other things to think about. There are other earlier books out there - but I am sure glad that Walter Lord took the time. As when I first read it, I loved the way it is written. It is not all facts and figures - but a down to earth narrative, which invites you in and keeps your interest. 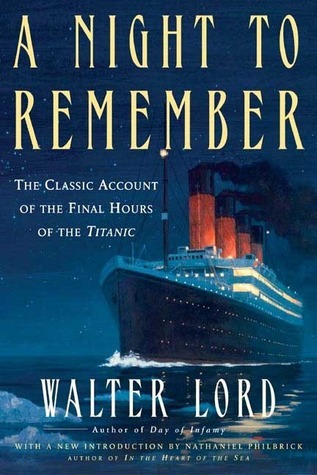 Working from countless letters and interviews, Lord weaves the tale of Titanic that at times made me smile, laugh and come back down with a bump as the reality of the events unfold. 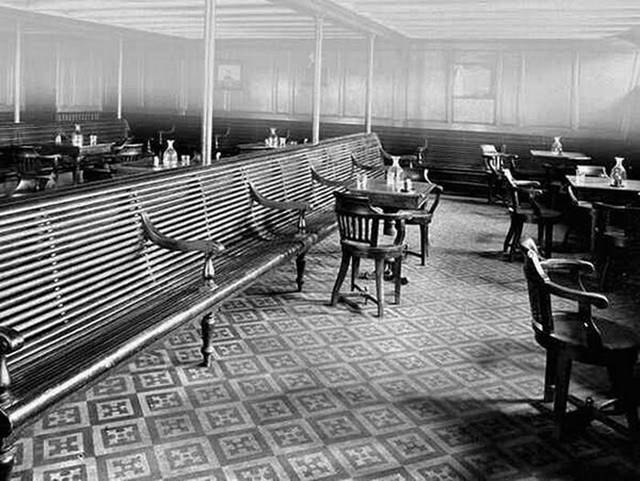 It made me feel a lot more connected to everything I have ever heard about the ship - from the reactions of First Class to the treatment of Steerage. There are many, many books on the market - some personal, some pragmatic - but this for me is definitive and the best place to start. 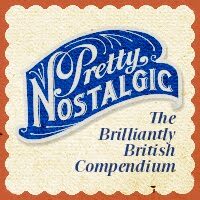 Just before the end of 2011, the wonderful Mat from Southern Retro, paid me a visit. We had met at The Chap in the summer (well..the supposed summer) and had a brief hello. We then bumped into one another at The War and Peace Show in August and had a proper chat. A couple of months passed and then he asked me if I would like to be part of the photographic project he is running. I messed him about a bit with weekends on and then off again (*blush*) - but I finally managed to get it together and Mat headed up to LandGirl Heights on a unseasonably warm December day. When he arrived, my hair was not done and I was in a proper flap. I let The Beard take over and entertain Mat with the lure of tea and cake, whilst I swore at myself in the mirror. Hair. Never does what you need it to. For some reason, despite being in my own home, I was quite nervous. As you can see, I refused to be parted from my slippers. I did check with Mat to make sure they would not be in shot. Any nerves I may have had were quelled by the cheery, chatty Mr. Mat. That and my concentration on posing for a picture without looking like - well - a poser. A week or so later, Mat sent me the ones he had chosen for approval. I vetoed some, on account of the many chins in attendance, and we finally settled on my official mug shots for the website. I was thrilled to then find out that one of the photo's had been featured in Mat's interview with Vintage Life Magazine. Which I duly purchased a copy of to show my Nan. 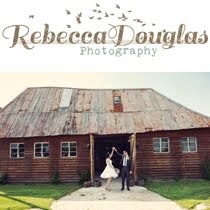 I love checking out new peeps that are added to this project. It always makes me smile. 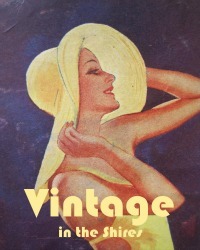 You can follow Southern Retro on facebook and twitter. I have been well and truly bitten by the Spring-clean-out-your-clutter bug. I have the achy joints and broken nails to prove it. Plus a whole tonne of treats for the charity shops. The spare doom is now known as the spare room once more - on account of being able to get in there and actually 1) find things 2) see the floor after emptying out various bags for life and 3) move about at more than a shuffle. Things have been tided away and can be found with ease. You may have noticed also that things have had a bit of a spruce round these parts too. I realised I had not changed the look of LandGirl1980 for way over 18 months. I had grown tired of a template that I loved the look of, but could not customise. 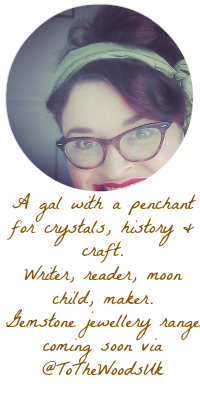 So - I have taken the plunge and freshened things up a tad. I have a lot more fiddling to do - like going through each post and adjusting the colour. Super yay. Please bear with me if, at any point, things go out of kilter. It will happen. A very long time before I saw the now infamous James Cameron movie (which I shall tell you now, I saw approximately 12 times at the cinema - I kid you not and make no apologies - and the re-release in 3D? Yeah - I shall be seeing that too), and developed my unabashed girl-crush on Kate Winslet - (seriously - I was obsessed - still am) I was interested in the history of the RMS Titanic. I have been trying to pinpoint where my fascination may have sprung from. The earliest I can recall was mention of it in Ghostbusters II. I think I remember asking my Pops what the Titanic was after seeing it appear on screen, complete with a gash in her side and passengers emerging. The scene spooked me. It still does. Because, as we all know, RMS Titanic failed to make it to her destination, along with 1,514 of her passengers. One of the greatest loss of life to a maritime disaster during peacetime. 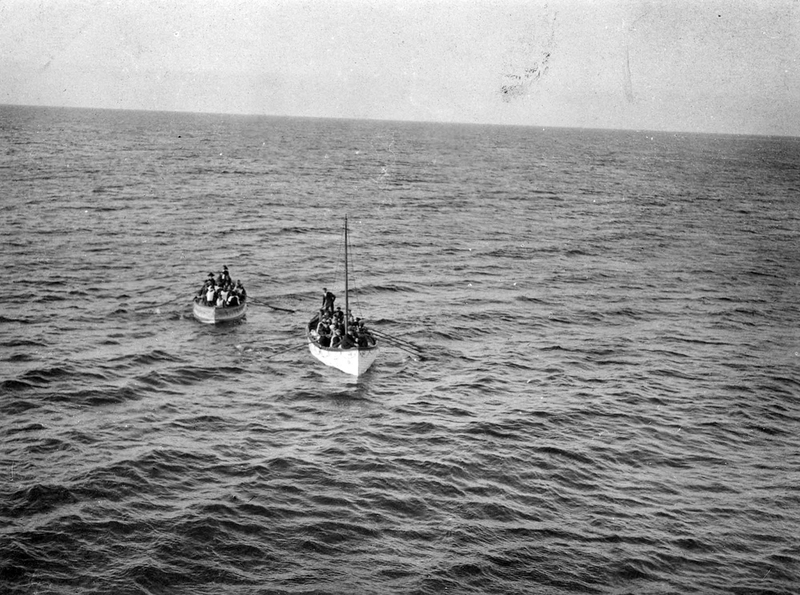 The picture below is the last sight of her as she left to cross the Atlantic on April 10th 1912. 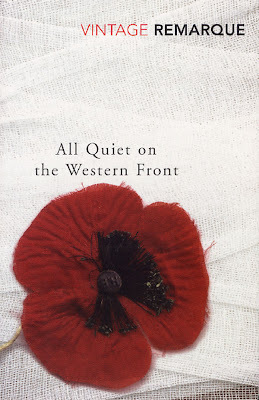 Today is the centenary anniversary of the event. An event that has reverberated down the decades, through the generations and still inspires interest, research and speculation today. I find myself thinking "Really - one hundred years ago? Fo sho?" - because to me it does not feel all that much in the past. I guess this comes from being someone who wallows in various historical periods at any given moment via books and general thought process. For me, things from bygone eras are never very far from my daily life. The floating microcosm of society at the time and the fallibility of an engineering marvel versus nature, has made me revisit books and programmes about RMS Titanic again and again over the years. 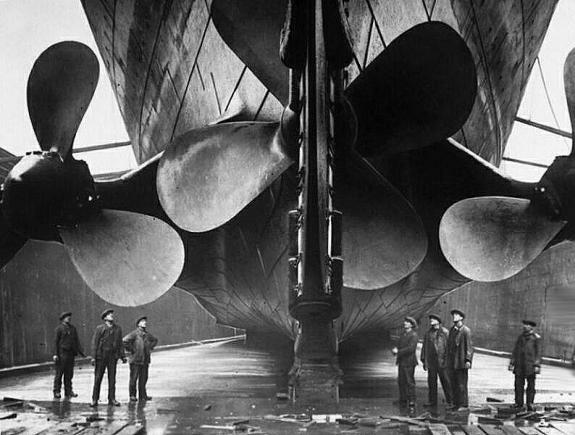 Titanic was the largest ship of the age, surpassed by her sister ship Olympic only just. There was a buzz around her from her city of origin in Belfast to New York who awaited her arrival. It was a sought after ticket. Not just by the upper echelons of society, some of whom were used to transatlantic jaunts for business and pleasure. In today's terms it as significant as the first flight on Concorde. 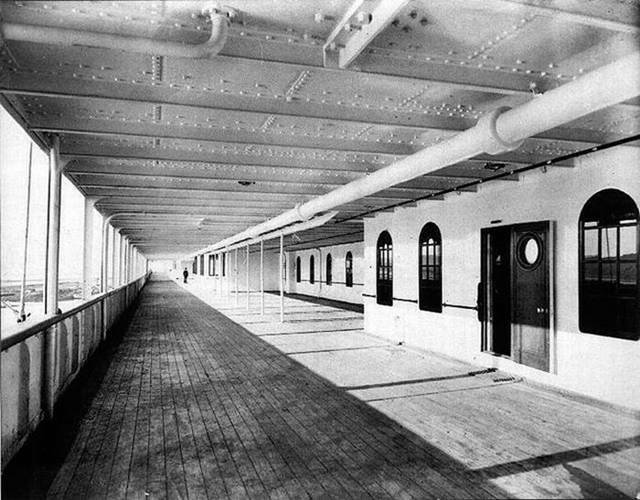 But aboard were also passengers who were leaving Europe for a whole new life. 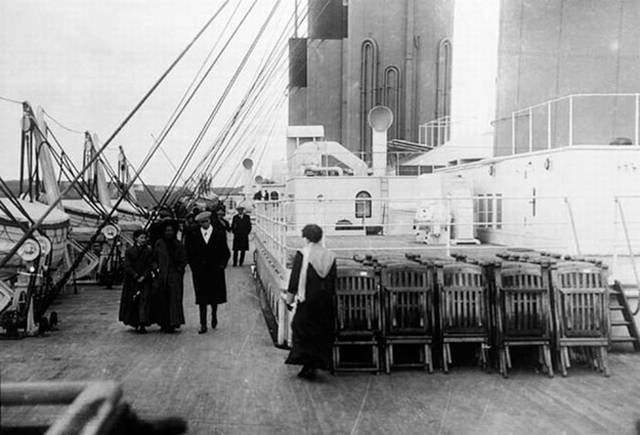 The steerage passengers who would later be trapped and forgotten about - fighting their way out and not daring to cross a roped off section to pass thorough 1st class to access the boat deck. The majority were clinging to their possessions. It always makes me wonder what I would take with me if I was leaving for a new beginning, far from home. What would be in my suitcase? What I would consider irreplaceable and want to keep with me at all costs? Whenever I read or watch something new about it, I always find out bits of information I thought I had already digested and stored away - like Southampton losing over 500 local people in the sinking. And that there are more memorials to the "Band that Played On" than any other collective group lost. Striking the iceberg at 11.40pm the initial reaction was of calm and puzzlement. Ice was kicked around the deck and placed in peoples drinks. The bulk heads would protect the ship from foundering, such was the belief. No need to panic. Other ships near received messages. Crucially the Californian, a mere 10 miles from the now stationary Titanic, had switched off her wireless and lookouts thought it odd that rockets were being launched. There is confusion as to whether or not they ignored light signals from Titanic or visa-versa . 500 miles away, the Olympic knew exactly what was happening due to her strong Marconi system, but was too far away to be of use. 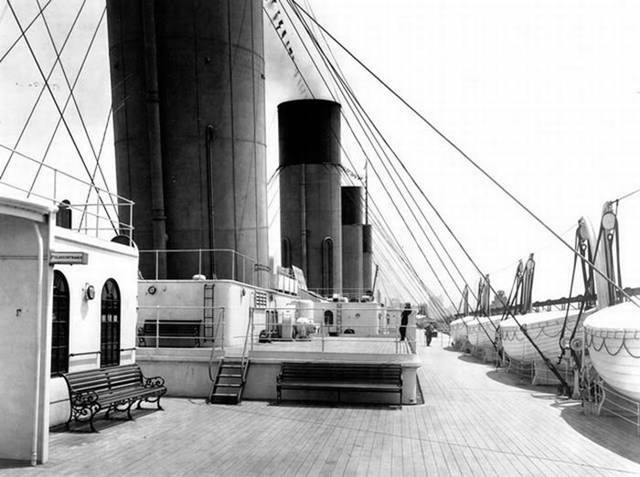 The Carpathia responded and began to make the journey to Titanic's aid. And so the loading of lifeboats began with women, children and - depending which side of the ship you were on - men. All lifeboats could hold 40+. One launched with as little as 12 passengers. 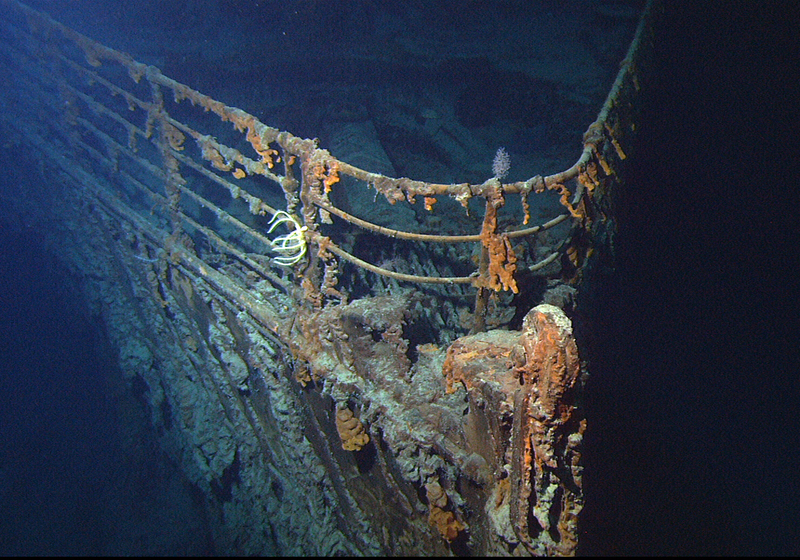 A mere 2 hours and forty minutes later, RMS Titanic was gone and became an ocean liner of legend. I find myself wanting to change the outcome in some way. To tell them to slow down. For the sea to be rougher, so there would be break water at the base of the iceberg. To break open the box containing the look outs binoculars, for which the key was not even on board, and hand them a pair. To place the first ice warnings at the top of the pile as opposed to the frivolous messages from passengers to those on the main land. To whisper to someone that if they hit the iceberg head on the chances of them making it to port were far greater. The loss of that one ship changed the rules and regulations of passenger liners for ever more. And no commercial ship has been sunk by an iceberg since. To me, the sinking of the vessel is a history marker. Not only in regards to the catastrophe itself, but also, a short time later the world changed forever with the advent of The Great War. I am pleased to say that I managed to dodge vast quantities of chocolatey goodness this Easter. The same cannot be said of cheese cake, brownie & ice cream, cider and one of the biggest and bestest roast dinners I have had in a long time. The yorkshire pudding alone was the size of an armchair. In celebration of the Springy time of year - which has graced us for the Bank Holiday with glum and chilly weather in the UK - I decided to give a cheery jumper an air.. When I opened it, I actually screeched with joy. It is made of the soft yellow wool which is exactly the same colour as daffodils. So whilst visiting my Folks, I decided to ponce about whilst caressing actual daffs. I adore the jumper's puffy sleeves and all it's intricate detail. I can just about manage a plait - so knitting it waaaay outta my league. Lucky I have friends with the clicky-clacky-knitty-natty ability then, eh. 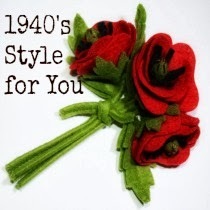 Not that the jumper needs adding to in any way - but I felt that this delightful handmade posy brooch from my new sponsor Viola Rose would look rather nice with it. I am not, in fact, pointing to my boobulous. I decided to give The Beard a break from taking my photo. 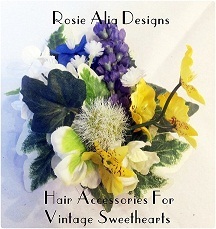 We had been frantically taking lots of pics of new stock for Well Rounded Vintage before my family arrived. Lots of lovely frocks upon the horizon folks! Hope you all had a nice break full of chocolate and a carboot trove or two! Ahh- HA! Remember this little series of posts? Well , here be Day Four which has (finally) landed and is so heavy it has been cleft in two from the sheer weight. You will notice that this post is another dual post, as we did so much. I am tired, just thinking about it! But - boy oh boy - was it interesting, eye opening, sad and humbling. After a massive breakfast amongst more screaming continental children than you could shake a stick at, a woman who paid more attention to her poodle than her husband and delicious Rosehip tea (which I might have pilfered some sachets of to bring home... *whistles*) we started the day at Langemark German Cemetery. It is a silent, peaceful - with a dash of eerie - place. Planted with row after row of Oak trees, there is an abundance of acorns. The grass appears lush and green. But, on both visits, I did not see one bird. Or squirrel. I feel that the sad truth of it is, so much lime was placed over the bodies, or the remains of, that there is not a lot of worms etc to be had, so there is a general lack of wildlife within this memorial. Perhaps? The contrast between this cemetery and any of the Commonwealth ones is stark. 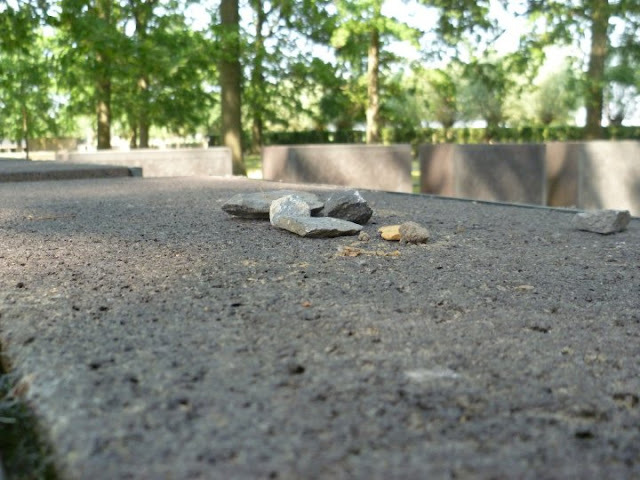 For one, all the stones are grey granite and they are laying down. And all the stones represent more than one person. This shocked and saddened me a great deal when I was first there. And no less on my second visit. I looked into it when I got home, and the very frank and basic answer as to why is that the Belgians, at the time, felt the need to give no more land to "The Hun" than absolutely necessary. They felt it right to give more land to the defenders of the country as opposed to it's attackers. I understand the ethos behind that at the time. But when that is compounded by how many men have been lain to rest at Langemark, it makes my head spin. In the "garden" above, surrounded by vast, strong, iron engraved memorials there are approximately 25,000 soldiers, airmen, medics and sailors. All brought from various other temporary cemeteries to a final resting place. And it was here that I encountered pebbles on top of some of the flat stones and memorials. The Jewish symbol of remembrance. This humbled me in a huge way. It made me think about all the people who had fought and died for Germany - only for Jewish veterans and their families to persecuted by the Nazi's 20 years later. 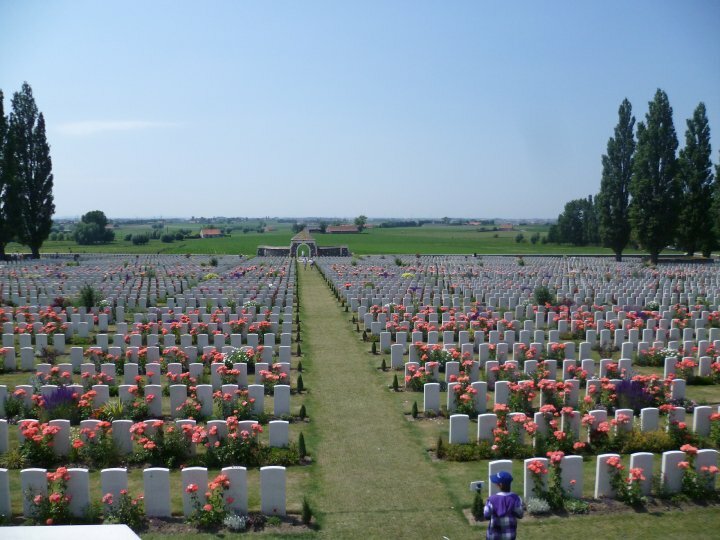 With a full head and a heavy heart, from here we travelled to Tyne Cot memorial. And here you shall see the difference I am talking about. The Tyne Cot Memorial has, of recent years, developed a brief, but poignant visitors centre. As you approach, along a pathway, you hear a voice. A voice that is reading out names. Names of soldiers who lost their lives defending the locality. In many cases, the disembodied voice tells the listener that solider of whom she speaks is "missing". She says this quite a lot. The visitors centre is, for me, a compact, but not overwhelming exhibition of artefact's. Letters, photographs, boots - which always make me the saddest, as it would have been on somebodies foot - a lighter, a mess tin. The centre has a clean, but personal approach. You are welcome to stay there for as long as you wish to read and absorb. When you think that Tyne Cot is the largest Commonwealth War Cemetery in the world, from any conflict, it is a lot to absorb. Near on 12,000 men are buried here. And that it just those with graves. So, someone like me, sits and has a quick smoke. 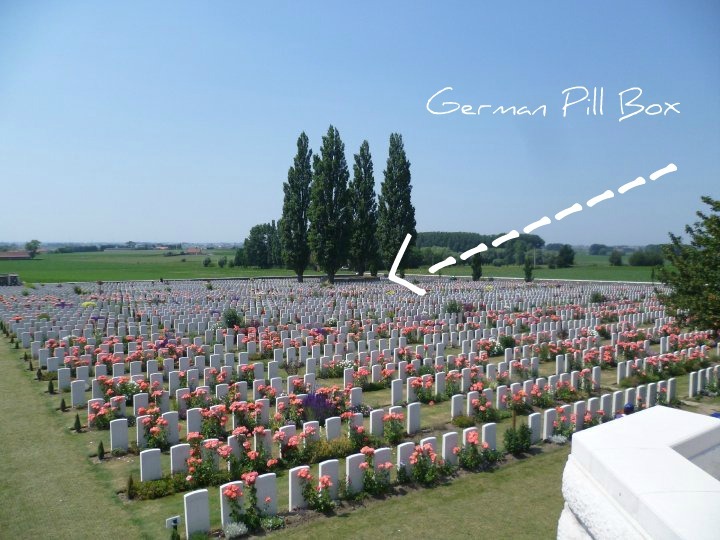 Here are buried British, Australian, New Zealand and Canadian soldiers. It is so peaceful and tranquil it is, even for me, hard to imagine the scene. There is a vast memorial to The Missing. With it's curved and seemingly endless walls. Of names. The name of this memorial is believed to stem from the Northumberland Fusiliers, who, upon seeing the German Pill Box defences, thought they resembled Tyneside worker's cottages. When I first visited this area in 2010 - it was a day of scorchio proportions. As you can see from the sky. Bluest of the blues! I was able to walk up and sit upon the Cross of Sacrifice, which although sounds sacrilegious in some way - a lot of people do. It is the best way, in fact for me, the only way to get a real sense of scale. And I think you need that. To be able to try and absorb. Because there are so many rows to walk through, to witness and to remember. It can all become a little blinding. Have you ever seen anything like this? No. Me neither. The scale of it shall never cease to leave me, mouth agog thinking to myself, and occasionally muttering "What.. the...actual... f..."
Ok - so - I feel that plenty for today's visit. A little bit more to come though.. so don't change the chanel too quick..